This autumn, the NYX Professional Makeup American cosmetics brand will open in Timişoara its first store in the west of Romania. The store will be located at the ground floor of Iulius Mall, part of the Openville mixed-use project, which is currently in full development and which will supplement the retail offer in the current shopping mall with an additional 47,000 sqm, adding up to a total leasable area of 118,000 sqm. The NYX Professional Makeup store in Openville Timişoara will be the second in the IULIUS shopping mall network, following the store in Iulius Mall Cluj. NYX Professional Makeup will provide clients with a complete, customized range of high quality beauty products. The American brand provides more than 2,000 professional products for make-up artists and cosmetics enthusiasts alike. Ranging from eyeshadows, primers, foundations, powders, blushes, highlighters, correctors, lip-glosses, liquid and classic lipsticks, mascara, false eyelashes, all the way to make-up brushes and other accessories, the NYX Professional Makeup products are a staple in the kits of professional make-up artists all over the world. NYX Professional Makeup was created in 1999 in Los Angeles. The brand has a worldwide presence both via specialty beauty stores and via its own locations. The store in Openville Timişoara will be the fifth to open in Romania, after the locations in Bucharest, Constanța and Cluj-Napoca. The Openville Timişoara mixed-use project is currently pending construction and will be the largest mixed-use project in the west of Romania and the main business, shopping and leisure destination here. The project will integrate the current Iulius Mall Timişoara and will complete the retail offer with 47,000 sqm of additional premises, thus adding up to a leasable area of 118,000 sqm. The new premises will be fitted in an expansion wing of the shopping mall, at the ground floor of the office buildings and in the upcoming park area of the project. Openville will include seven class A office buildings, 450 stores, a new concept of multiplex cinema, two conference and event centers with 10 halls, as well as a variety of restaurants and themed cafés, with a panoramic view overlooking the largest suspended park created from scratch in Romania. After the two office buildings completed in 2017, works are underway in Openville Timişoara for two other office buildings, the new retail spaces, an underground parking lot with more than 580 parking spaces, as well as a traffic underpass that will streamline the traffic in the entire area. The project is developed by IULIUS and Atterbury Europe, adding up to an estimated investment upwards of € 220 million. 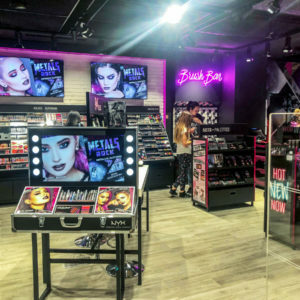 The post BRAND PREMIERE IN TIMIŞOARA: NYX PROFESSIONAL MAKEUP TO OPEN A STORE IN THE OPENVILLE MIXED USE PROJECT THIS AUTUMN appeared first on Business Review.